Who could ever live without being in the possession of a glue pot?! Well, probably anyone... 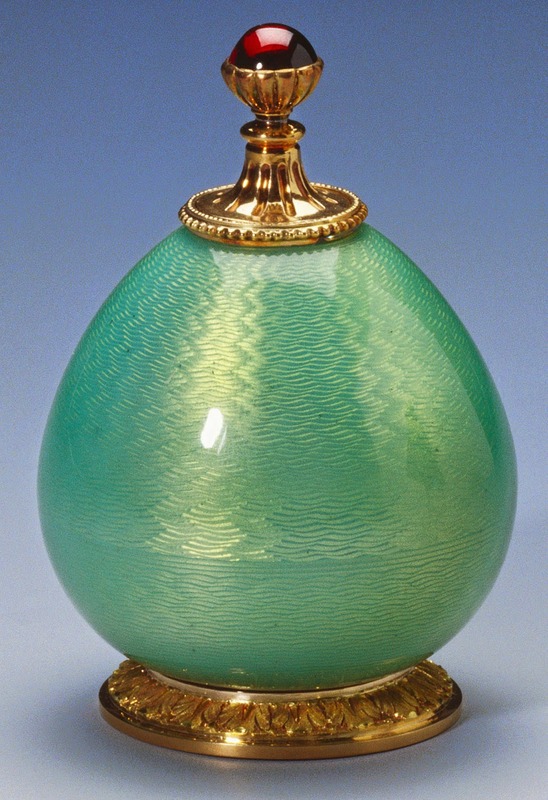 But if the glue pot was made by Fabergé - like this one - you might want it anyway. It was made by workmaster Feodor Afanassiev, sometime between the years 1896 and 1908! The pear-shaped pot is covered in pale green enamel over a guilloché ground, and has a circular gold foot chased with a foliate border. The two-colored beaded neck is fitted with a brush that has a fluted gold handle, with a cabochon ruby set in a gold petalled cup at the top. It's dimensions are 2'' x 1.3'' x 1.3'' (5 x 3.4 x 3.4 cm), and it can be found in the Royal Collection.